if you are like me, i had you at “goat cheese”. goat cheese is one of those things you pine for. i love cheese, all kinds, but goat cheese is on a different level. the creaminess, that tang.. it lovingly forces you to close your eyes after each bite and savor it. and these biscuits do it every justice. this recipe is adapted from my friend shauna niequist’s book, bread and wine. i have only made one small change (added a bit more goat cheese) for they are perfect as they are. these biscuits are fabulous with a big bowl of hot chili, a hearty soup, or on a cold morning, lightly toasted, with butter and strawberry preserves. they have become a new tradition on our thanksgiving and christmas tables and i hope on yours too. 1. preheat the oven to 425 and place a 10-inch pan or rimmed cookie sheet into the oven while it’s preheating. 2. in a large bowl, combine the flour, baking powder and salt and whisk to incorporate. cut 4 tbsp cold butter into small pieces, then cut into the flour mixture. add the yogurt and goat cheese and stir to combine. 3. remove the pan from the oven and place a tablespoon or 2 of butter (depending on the size of the pan) into it. as the butter melts, spread it around, making sure it covers the entire pan’s surface. divide the batter into 9-12 biscuits (depending on how big you want them) and place them in the pan (in a smaller pan they will fit pretty tightly). 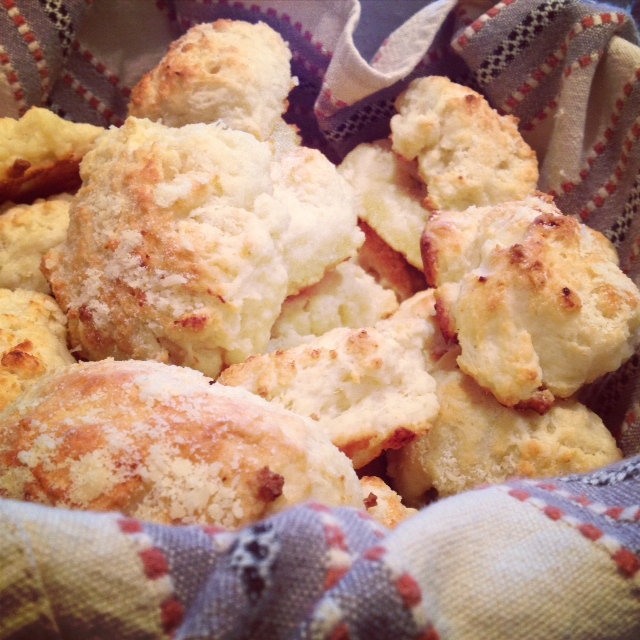 4. brush the tops of the biscuits with 1 tbsp melted butter. bake for 14-16 minutes until browned on tops and bottoms. about 2-3 minutes before they are done (when the tops are just beginning to golden) remove from the oven and sprinkle with grated parmesan cheese (if it’s freshly grated, it melts much better). cook the remaining 2-3 minutes, and serve warm. i'm not a huge proponent of ripping people off on the internet, so i will give credit where credit is due. unless otherwise noted, pictures & recipes are mine.